Jens Debusschere wins his first classic on a dark day in Belgium, out-sprinting Bryan Coquard, who sat up too soon to celebrate. On a dark, rainy Wednesday in Belgium, one day after shocking terrorist attacks, Lotto – Soudal’s Jens Debusschere gave his home crowd the win they wanted, perhaps needed, at Dwars door Vlaanderen. Another Belgian, BMC’s Greg Van Avermaet animated the final 10 kilometers with a bold solo attack. He was caught in sight of the finish, and Debusschere’s brilliant lunge at the line won the day, as Bryan Coquard sat up too soon, thinking victory was assured. The early breakaway in the rainy 200-kilometer race included Alexis Gougeard (Ag2r La Mondiale), Jesper Asselman (Roompot – Oranje Peloton), Phil Bauhaus (Bora – Argon 18), Alex Kirsch (Stolting Service Group), Igor Boev (Gazprom – Rusvelo), and Kevin Van Melsen (Wanty – Groupe Gobert). With about 80 kilometers to go, LottoNL – Jumbo’s Mike Teunissen rode clear of the peloton. 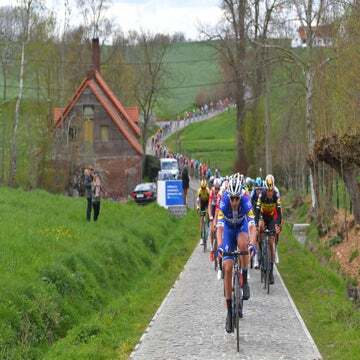 Topsport – Vlaanderen’s Jonas Rickaert soon joined the attempt to bridge to the leaders. Luke Durbridge (Orica – GreenEdge) added his extra horsepower, and the three instigators rode clear. Boev and Gougeard were dropped from the lead group and joined forces with the chasers. The Ag2r rider couldn’t keep the pace and was soon dropped as the peloton narrowed the gap to about one minute ahead of the Taaienberg, with 52km to go. The break was another 45 seconds ahead as Trek – Segafredo’s Edward Theuns ratcheted up the pace in the bunch. Eight riders went clear of the peloton after the Taaienberg, and three more soon joined the escape. With about 44 kilometers to go, the large breakaway caught Teunissen’s chase group. The lead four riders remained up the road by about one minute. The day’s next challenge, the Oude Kwaremont, reshuffled the race again. Van Melsen went clear of the break, and the large chase, 30 seconds back, collected all of the remaining escapees save Kirsch. The Flandrian hills were unrelenting. The chase, now reduced to four riders (Nikolas Maes, Oscar Gatto, Durbridge, and Dries Devenyns), caught Kirsch at the crest of the Paterberg, 31 kilometers from the line. 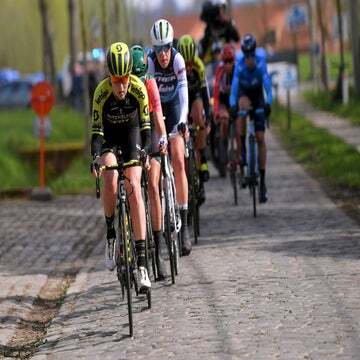 Over the next 10 kilometers, the chase group’s size increased, and with about 20km to go, Lotto – Soudal’s Tiesj Benoot attacked at the top of the paved Vossenhol climb. Benoot and his five companions soon caught Van Melsen. With 15 kilometers left, their advantage was 24 seconds. The seven-man break bickered and attacked each other just outside of the final 10 kilometers, and accordingly, the peloton pulled the race back together. Before the race’s final hill, the Nokereberg, Van Avermaet attacked alone. Blasting up the cobbled climb’s smooth gutter, the Belgian had a slim lead at the top with about eight kilometers to go. Van Avermaet extended his lead to about 12 seconds with 5km left. Etixx – Quick-Step drove the peloton, working for Fernando Gaviria. Under the red kite, the Belgian had a whisker-thin lead, and Etixx’s Niki Terpstra had him in his sights. Rounding the final left-hand bend, Trek – Segafredo took over, catching Van Avermaet with 250 meters to go. Gaviria opened the sprint early but faded as Direct Energie’s Bryan Coquard looked to have the win in the bag. But the Frenchman sat up too early to celebrate, and Debusschere snatched the win by a bike throw, as the sun finally began to shine through.